I love my cfl’s for the sole purpose of saving energy costs, don’t get me wrong…but I hate the light quality that they produce. Therefore I’ve relegated them to use in our reading lights, lamps with patterned shades [to help disguise the light color], and any overhead lights with frosted glass shades. So with that disclaimer, I launch into a post about bare bulb lighting. It seems to be everywhere these days, as are edison bulbs. (Even my mother-in-law has used them in her new guest house!) And now that we’ve moved into a new apartment with TERRIBLE cheap, brass apartment light fixtures, we’re looking for some relatively inexpensive light fixtures that we can replace these gaudy brass ones with. Now, I’m sure you’re thinking…why would you replace them? This isn’t your apartment! Well…true that. But we will be living here for quite some time, and when we move we can always put back up the ugly ones and take the new ones with us. 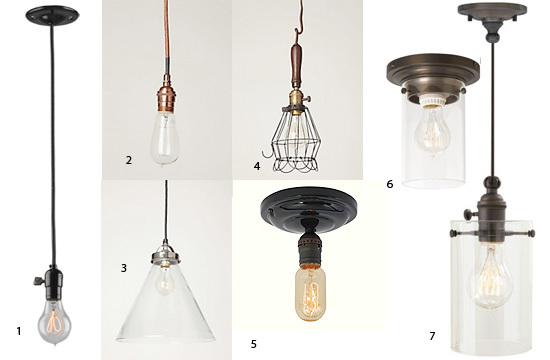 Sooo…with that being said, here are a few of the bulb-exposing fixtures that have caught our eye during our lighting search. 1. 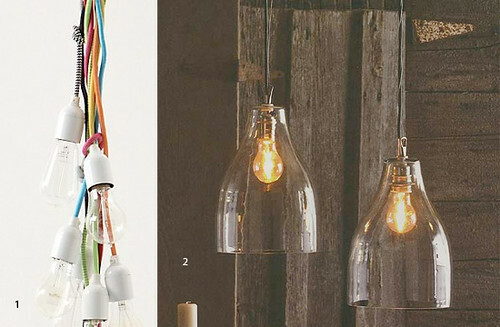 Burnside Bulb Pendant from Rejuvenation $112, comes in 12 finishes and different classic cord colors. 2. Blazon Gleam Copper Pendant from Anthropologie $98. 3. Barely There Pendant from Anthropologie $248. 4. Mechanic’s Beacon Pendant – Large Flower from Anthropologie, $148. 5. 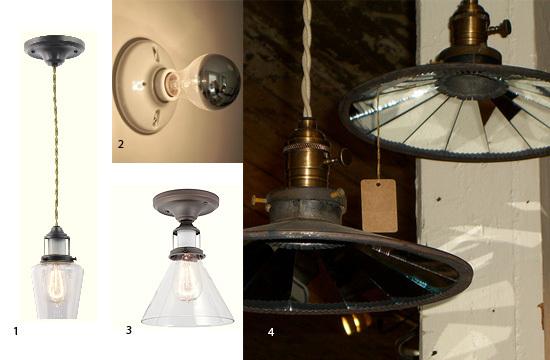 Defiance Bare Bulb ceiling mount fixture at Schoolhouse Electric, $89. 6. Clark Flushmount Ceiling Fixture by Wilmette Lighting at Affordable Lamps, $200. It reminds me of this Roost table lamp, but for your ceiling! 7. Clark Modern Pendant Light by Wilmette Lighting at Affordable Lamps, $292. Well, I guess by the title you know which choice we made for our master bedroom! Although we liked the quality of Charles Rogers’ beds, we didn’t really like any of their king size styles. (Definitely have to give them props for making quality beds with iron & real brass versus aluminum and painted brass finish like the competition though!) So that just left one last option — hunting for an antique bed frame that we could convert to a king size…and someone to do it. After a lot of digging I discovered that there aren’t that many people who are willing to take on the trouble to convert an antique bed. Who knew?! My search only turned up just a couple of people across the nation! 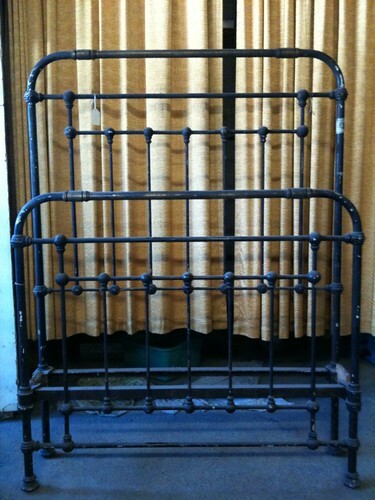 The perfect choice for us was Hobnail Antique Beds in Pawling, NY. 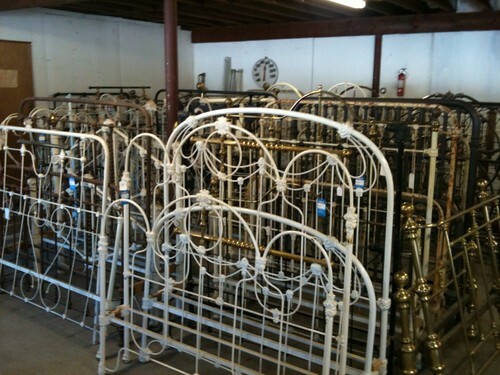 Look at all those gorgeous antique beds! I had a wonderful afternoon with the owner, Jerry. In the two hours I was there chatting with him and choosing the perfect bed for us, I was extremely impressed with the quality of the finished product and thrilled to meet someone who took so much pride in his craftsmanship. 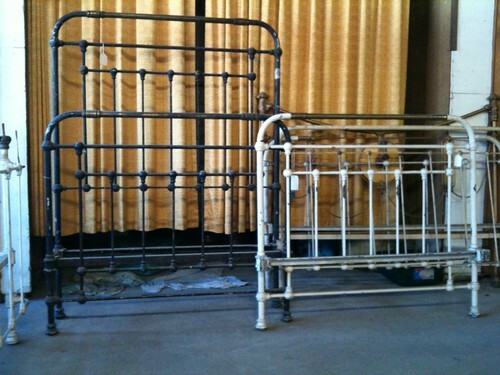 Jerry strips, cuts, welds, and paints the beds himself. I got to look at some of the beds he was currently working on and as well as a few he’d just finished and his craftsmanship was beautiful. You couldn’t even tell these beds hadn’t always been a queen/king size. 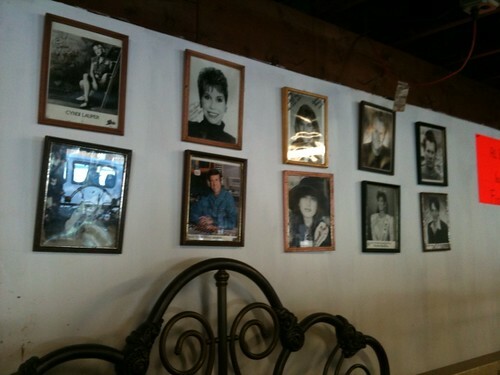 Also, he made some beds for a few famous folk, including Cyndi Lauper and Kevin Bacon. 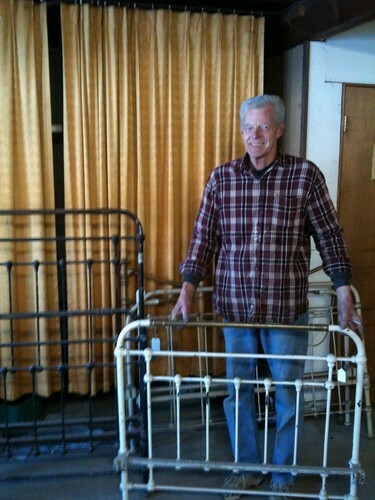 Jerry was kind enough to pose with my new beds…and in about a month they’ll be done! I can’t wait!!!! We looked at Restoration Hardware (too expensive), Pottery Barn (too bland), Ikea (too low-quality), “regular furniture store” (just plain yucky), Room and Board (not our style), and a host of other ones (all ruled out for various reasons). The more we looked, the more we realized that I wasn’t going to be happy with anything that wasn’t a classically made iron bed. This seemed to leave only two options: 1) Charles P. Rogers – still making beds the old fashioned way or 2) just buy an antique and have it converted to a king size. Check back soon to see what we did!